Handmade soap makes a lovely gift. It’s something you can create easily at home and won’t cost a fortune. Your recipient will be so impressed when they open this beautiful soap. 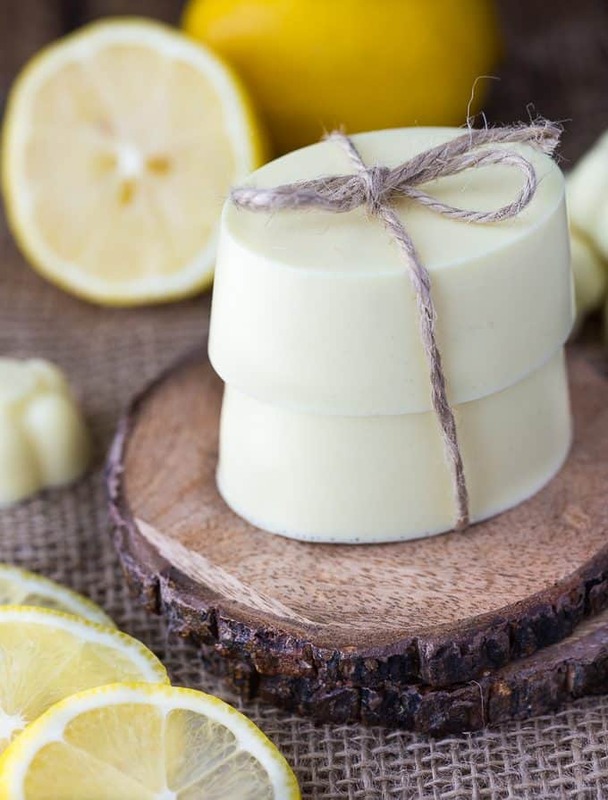 This Lemon Shea Butter Soap is one of the loveliest soaps I’ve made. I’ve made a bunch and am wrapping them up for gift giving. Shhhhh. Melt and pour soap bases are the way to go if you like easy DIY’s. I do so that’s pretty much all I use when I make my own soap. You can pick them up at any craft store or on Amazon. Makes 4 to 6 bars. Add soap to a microwaveable bowl. Microwave on high for 30 seconds. Microwave an additional 10 seconds. Stir. Continue to microwave in 10 second intervals, stirring in between, until soap is melted. Stir in soap colorant and essential oil. Pour into a silicone mold. Let sit for 40 minutes to 1 hour at room temperature until hardened. Remove from silicone mold by gentling pushing on the bottom. I also used a yellow soap colorant I bought on Amazon to give it a pretty and soft hue. The scent comes from the lemon essential oil. I use essential oils in many of my DIY beauty tutorials. I also recommend you buy a silicone soap mold. They will make your life so much easier! Don’t bother with the cheap plastic molds. The silicone molds are the way to go! You can use them in baking too if you like. Multi-purpose for the win! Do you know anyone who would love to receive a beautiful homemade soap? 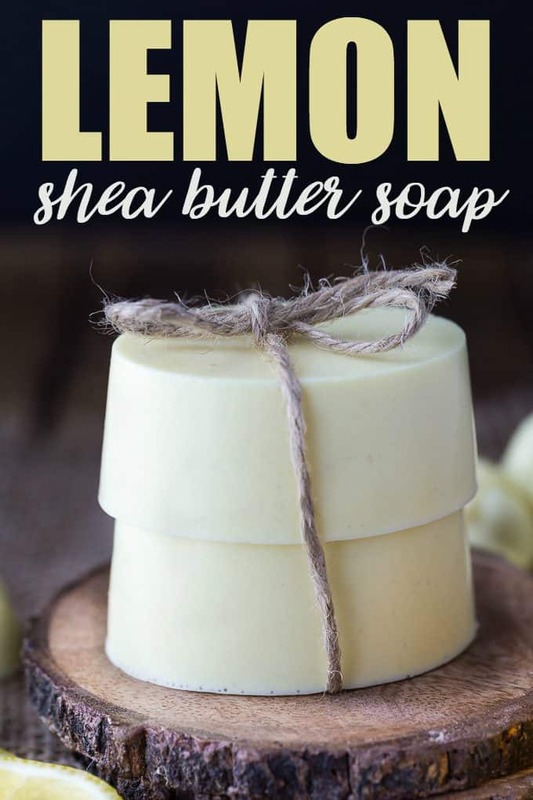 I think this is a beautiful soap and Lemon is a good scent for a soap and I bet is smells incredible. I think this soap would be a great gift idea for the Holidays! Sounds like a really nice soap combination, would love to make homemade soap at some point. Yes, it will depend on how big your mold is. I use half of the melt and pour soap base package. Mmmm…I love the smell of lemon! Thanks for sharing with us at Funtastic Friday! Nothing nicer than hand made soap. I love handmade soaps- my girls would love doing this too! I heard recently about this melt and pour soap making idea, it sounds fab. I love how classy these soaps look and think they’d make a lovely gift. I hope to see you there next time, too! Hi there – I like that this is a simple recipe. Only one fragrance is needed to give that fresh feeling. I agree silicone molds are so easy to release. However I do use plastic molds, as I package my soaps in soap boxes, and I can easily find a good fitting box for the rectangular plastic molds. Thanks for sharing your recipe.